Today’s post will highlight concerns regarding brewer’s and nutritional yeast. They have the potential to offer great benefits, but they have some booby traps that I think we should all know about. Because the line of distinction between brewer’s yeast and nutritional yeast has been smudged and is no longer clear, I will refer to these products together simply as “supplemental yeasts.” As always, a reminder that my blog and posts are stories of what I am learning, and they are not written for medical advice or treatment. 2. Supplemental yeasts may have synthetic vitamins added, particularly—but not only, vitamin B 12. Brewer’s yeast and nutritional yeast intrinsically have LOTS of vitamins and minerals, even if they are not fortified. Most of the vitamins and minerals come naturally from nutrients the yeast incorporates from the growth media (grain, sugar beet, or sugar cane products), but sometimes supplement manufacturers add synthetic vitamins and minerals to enhance their product. The enrichment process can occur during or after the yeast growth period. It is expected that nutritional yeast contains vitamin B 12 because vegetarians and vegans often rely on it for their vitamin B 12 requirements (thus their “nutrition” as in “nutritional yeast”). Some brewer’s yeast brands can contain vitamin B 12 too, while others do not. Yeasts have no need for vitamin B 12, so it must be added to the product in some way. Synthetic cyanocobalamin is typically added and not the preferred methylcobalamin, an actual physiologic form. Why is this a concern? Well, some people do not convert cyanocobalamin well to the needed methylcobalamin. Vitamin B 12 aside, each yeast brand will vary slightly in which vitamins and minerals it contains and how much of each vitamin and mineral it contains. Content and amounts will depend on what the yeast is grown on (beer, grains, sugar beets, or sugar cane products), if any extra vitamins and minerals were added to the “broth” the yeasts were grown in, and if any vitamins and minerals were added at the end of the process as fortification. By enriching the “broth” of the growth media, the yeast can be coaxed to take up some vitamins and minerals it doesn’t normally use much of, so sometimes manufacturers add vitamins and minerals to the growth medium. The vitamin and mineral content of supplemental yeasts can be further enhanced by adding desired vitamins and minerals after growth. I’m not a mycologist (person who studies fungus), but I would assume that any vitamins and minerals present in the culturing broth would be assimilated into the yeast in physiologic forms. For example, folic acid would be converted to a form of folate. However, if the vitamins and minerals are added after culturing, then the forms will be whatever forms the manufacturer chooses, much like a multi-vitamin. Make sense? Important note: Many supplemental yeast labels which are NOT fortified list “folic acid” as an ingredient. However, if the yeast is indeed not fortified, then the supplement in fact should contain “folate.” The representative for Swanson’s brewer’s yeast informed me that they are not required to differentiate between folic acid and folate on labels. Bummer. 3. Supplemental yeasts may contain gluten. Some brands declare they are gluten-free, but other brands do not make that statement. Because these supplemental yeasts, whether brewer’s yeast or nutritional yeast, can be grown on grains, sugar cane molasses, and sugar beet molasses, it is important to verify gluten-free status if you need to be gluten-free. When I called Swanson’s, the representative could not verify gluten-free status; even though most of their providers grow their yeasts on sugar beets, it was possible that the yeasts came from other sources. 4. Supplemental yeasts contain glutamic acid (glutamate): All the supplemental yeasts (both brewer’s and nutritional yeast) have glutamic acid, an amino acid, in them because it is a part of the yeast cell’s proteins. Upon processing, the glutamic acid may become “free glutamic acid,” similar to MSG (monosodium glutamate). Free glutamic acid can act to stimulate neurons in the brain, and some people are either very sensitive to them and/or they don’t break the glutamic acid down well in their GI tracts. (We actually have enzymes to deal with glutamic acid in our GI tracts, and we can break down a certain amount. Some people, however, do not have either enough or good enough function of these enzymes.) The glutamic acid then can lead to uncomfortable reactions like headaches, irritability, fatigue, and other reactions. Some yeast products are heated to high temperatures during processing, and these temperatures can further increase free glutamic acid. Some companies state that their products are not exposed to such high heat (low heat processed), but I could not find a supplemental yeast that was not heated to at least pasteurize it. (This does not seem like a raw food to me.) Whether or not the free glutamic acid content is significant in supplemental yeasts seems to be up for debate. Some people say that the glutamic acid in supplemental yeast is not free glutamic acid and therefore not problematic. Others say it is free glutamic acid. I couldn’t find a definitive source. Of interest, many processed foods contain “autolyzed yeast” and “yeast extract” for flavor enhancement. These often take the leftovers from true brewer’s yeast made on hops, break down the cell walls of the yeasts with enzyme, and use the peptides and cell wall constituents (including the now free glutamic acid) for flavoring. These are basically equivalent to MSG. 5. 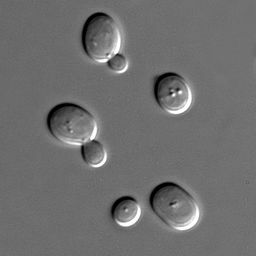 Supplemental yeasts can cause cross reactions in yeast and/or mold-sensitive people. Some people ask if these supplemental yeasts will make their Candida and yeast infections worse. No. They are inactive yeasts and cannot. However, if people’s immune systems and gastrointestinal systems are very sensitive to yeasts, they may have a negative reaction! It’s not that the yeast is growing in them, but due to a cross-reaction. The body has learned to react to the yeast proteins (epitopes) in say, Candida albicans, and there will be yeast proteins in the supplement which can mirror Candida’s proteins. Usually, if a person does poorly with something like kombucha (remember from an earlier post, it is just a strain of the same yeast), there’s a good chance they’ll do poorly with these yeast supplements. 6. Crohn’s disease and ulcerative colitis Concerns: Crohn’s and ulcerative colitis patients have antibodies to Saccharomyces cerevisiae, particularly Crohn’s patients, so they should practice caution in trying supplements from these supplemental yeasts. 7. Monoamine oxidase inhibitors and Demerol drug interaction: Patients on monoamine oxidase inhibitor drugs for depression (or other indications) and/or Demerol should avoid these yeasts. Supplemental yeasts have high levels of the amino acid tyramine which can interact with monoamine oxidase inhibitor type medicines. Closing: Despite being the same type of yeast, each supplement is NOT the same! Please know that you MUST treat each supplement, whether it is brewer’s yeast or nutritional yeast, on an individual basis. And one supplemental yeast that is good for Tom will not be good for Joe. No matter what anyone says. Next post, I believe, will summarize the points in this post before I then move on to why people use these products and what I found to support or refute the touted benefits. Sources to follow at end of the series. There are a lot. In the meantime, please, if you want to know a source—ask! I don’t mind. Questions, comments, and corrections welcomed. This entry was posted in Nutritional Intervention and tagged brewer's yeast, crohn's disease, glutamates, gluten-free, GMO, mold, MSG, nutritional yeast, supplemental yeasts, supplements, synthetic vitamins, ulcerative colitis, vitamin B 12, yeast on February 23, 2015 by thehomeschoolingdoctor. Any idea where I can find it? What brand? Did you see this post I wrote later? It has links to several brands I looked at, but more importantly, it also has some comments from people on some different brands they looked up. Off the top of my head, I cannot name a brand with the methyl form of B12. That is a tough component to come by in brewer’s yeast/nutritional yeast. Most will be cyanocobalamin. So I’d definitely check with the manufacturer for any listed B12 before using. Finding one with “real” folate is easier because the bacteria can produce that. Not really the case with methylcobalamin. Good luck. With something like that mutation, call those manufacturers and make sure you’re getting what you need. These formulations seem to change so fast it’s not even funny (or right). Hi Teri, do you know if Swanson’s Brewers yeast is fortified? I assume it isn’t. What do you think of the product ? I’m happy with it so far. Thanks for your insights and research! I took a ton of it for the first time yesterday and felt amazing. Definitely part of my daily routine now. You’re welcome. It has so many vitamins and minerals. Can you recommend a brand of nutritional yeast that would be more ideal in terms of the GMO factor? Hi, Michan! Greetings to you. This follow-up post might help.